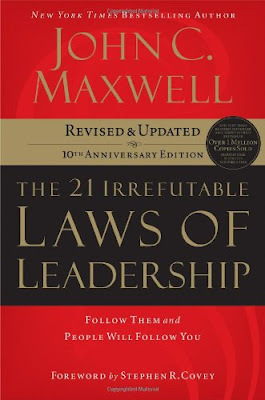 The book I read this week was The 21 Irrefutable Laws of Leadership by John C. Maxwell. I really enjoyed this book. I was skeptical of any book that used the word "irrefutable" in it's title, but I would have to agree. Some of the laws are a little more generic than others, however, they are all needed to be the best of the best. That's what I am going for and I hope you are too.I'm going to focus on the fundamental concepts of building an amazing leadership focused organization. Leadership is incredibly important within any organization. Whether you are working on a class project with eight people or running a company with 8,000 employees. You need to be very deliberate in organizing the structure of leadership within the organization, then putting the right people in those leadership positions to create the potential for growth and development, and lastly, encouraging empowerment within your leaders, to have everyone, from the bottom to the top, focusing on ways to make the organization better. Organizations work most effective when each person has a single leader. Clearly, communication is one of the most important portions of business. If you have more than one leader per person, communication gets quite skewed. The problem with multiple leaders is that each person will have expectations and those expectation don't always exactly match. Most organization's structure looks like an upside-down tree. You have one leader at the top and you trickle down, but at no point, in a successful company's tree, do you see more than one leader attached to an employee. How do you get the right leaders in place? My favorite concept from this book is The Law of Magnetism. Leaders will attract people like themselves. Now, the people attracted won't be an exact match to you, but they seem to correlate in a few areas: Attitude, Background, Values and Energy. This idea is logical because you know you. When you are taking applications for a hiring or recruiting for an organization, you are attracted to the people that are like yourself. When you talk to someone you will subconsciously be aware of the small details in conversation that match the qualities you excel in. This is a powerful concept that really makes an organization shine. If you have great leaders in place, act as a face of your company than those people will be hiring rock-stars- like themselves- into the organization. Conversely, if you have someone that is just average you will magnetize a multitude of average people into the organization. Now that you have the right people in the organization you must understand The Law of Progress. Leadership skills don't manifest overnight once someone is brought into an organization. Some people have a natural gift to learn how to lead quickly and some don't. You have duty to mold the people you have attracted into the organization to be the next version of yourself. And you only get as much as you give. Spend time developing your people and you will see the rewards of your hard work in time. They are important to all managers. They must be clear and well defined. Priorities are important for many reasons. Maxwell's Law of Priority is well said with this paragraph "First, when we are busy, we naturally believe that we are achieving. But busyness does not equal productivity. Activity is not necessarily accomplishment. Second, prioritizing requires leaders to continually think ahead, to know what's important, to know what's next, to see how everything relates to the overall vision. That's hard work. Third, prioritizing causes us to do things that are at the least uncomfortable and sometimes downright painful." Well said! Each level of an organization needs to have priorities well established. They create a road map for success. If they aren't there, the leader is likely to create the road map on their own and while the rest of the organization is going north that leader will be going south and ultimately that leader will working against the progress of the organization. The World has been a gross misconception about leadership. Leading is not about enriching yourself... it's all about empowering other people. In television and movies you see leaders portrayed as positional powerhouses that are controlling everything and everyone within an organization. They are seen micromanaging all the leaders within their companies. A lot of people use this philosophy in their own leadership. It sometimes stems from misguided fear. Everyone should be using The Law of Empowerment, but managers think if they empower their leaders, they will train them to do everything and they will work themselves out of the job and their superiors will not recognize any work done by them. The truth is that if you empower your staff and if you ensure that your leaders can accurately fulfill the duties you delegated, you will make yourself absolutely indispensable to the organization. You will have more time to focus on special projects. Focusing on developing leaders to be like yourself, instead of merely attracting followers is using The Law of Explosive Growth. You'll build yourself a reputation of an amazing leader because you developed more leaders for the company. And then you'll find yourself in the spotlight of the company... accepting promotion after promotion. Here is a few versus that Maxwell uses that illustrates the difference in focuses. So get out there and lead people. Invest time into educating yourself on leadership techniques and pass that onto everyone in your team. Don't try to be the smartest person in the room. Be a leader of people and make your organization propel itself into unparalleled growth. This book was great. If you are a leader in any arena; home, church, or work, take a look at this book! If you have any questions on the book don't hesitate to ask. I would be more than happy to help anyone that wants it.